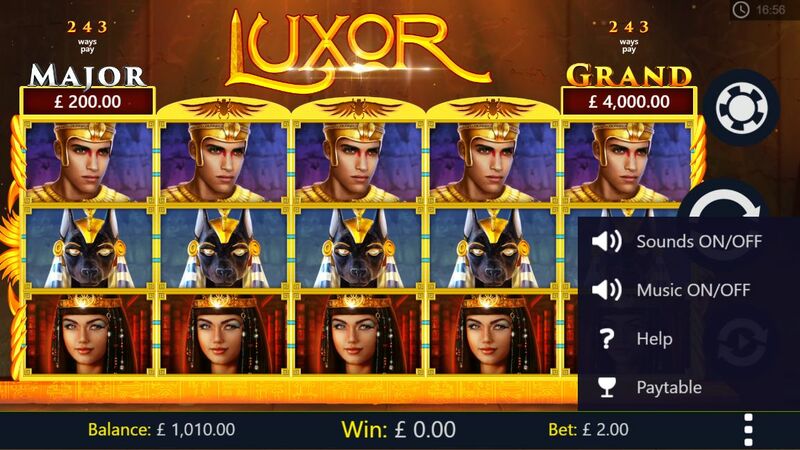 What are the game controls used in Luxor? Enables playing the game automatically for a predetermined number of spins at the current number of line and bet configuration. To open the autobet \ autoplay, click on the icon next to the “SPIN” button. To set the autobet \ autoplay number of rounds, click on Change Autobet Rounds and choose your desired number of rounds from the list. To close the list, click on AUTOBETS above the number of rounds list. To set the autobet \ autoplay limits, click on the 'Plus' sign on the upper right corner to reveal the autobet options. To minimize the options, click on the 'Minus' sign on the upper right corner. To start the autobet \ autoplay, click the 'Play' button on the bottom left corner. Once clicked, the play button will change to a pause button that will allow you to pause the autobet whenever you choose. You can only pause in between rounds/spins and not while the round is in play. To close the autobet, click on the 'X' sign on the upper right corner. 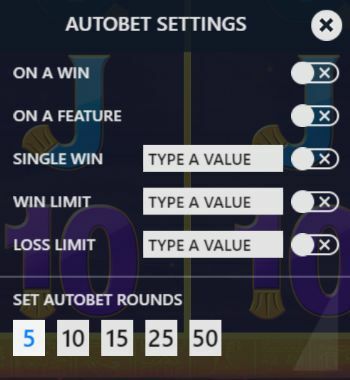 During autobet play, the settings panel is closed. To access Autobet while playing from a mobile device, click on the autobet icon above the 'SPIN' button or click on the settings button on the bottom right corner and then on the autobet tab. To activate a limit, you will need to click on the relevant checkbox and enter a numeric value on the right side (in the case of 'Single Win', 'Win Limit' and 'Loss 'Limit') and click on the 'START' button on the bottom left corner. To exit the autobet \ autoplay screen without starting the autobet rounds, you will need to click the 'X' button on the bottom right corner. After clicking on the 'START' button, the game will return to the main screen and the 'SPIN' button will show the autobet rounds counter. To stop the autobet \ autoplay, you will need to click on the autobet button again. Pausing the autobet is not possible in mobile mode. 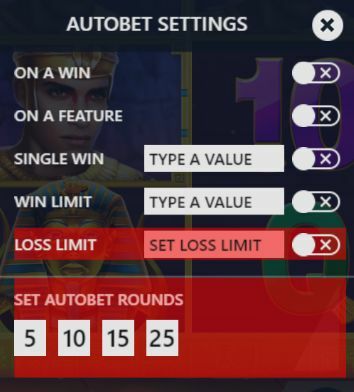 Loss Limit - Allows you to control your combined losses by entering a numeric value that will stop the autobet function and trigger a popup message when the loss limit is reached. Calculated as follows: (Sum of bets) - (Sum of wins) >= (Loss Limit amount). Single Win - Will stop the autobet function and a popup message will be displayed when a single win payout is >= the 'Single Win' value entered. Win Limit - Allows you to control your combined wins by entering a numeric value that will stop the autobet function and trigger a popup message when the win limit is reached. Calculated as follows: (Sum of bets) - (Sum of wins) >= (Win Limit amount). On a Win - The autobet will stop and a popup message will appear on any win within a single round. A free spins feature is considered as one round for this limit setting and the autobet will only stop after all the free spins are finished. Stop on a Feature - The autobet will stop and a popup message appear when the game reaches any feature round, including but not limited to: free spins round, bonus games and mini games, with exception to random wilds features. Loss Limit - "Loss limit reached"
Win Limit - "Win limit reached"
Single Win - "Single win reached"
On a Win - "Win reached"
Stop on a Feature - "Feature reached"
Players from the UK (under the UKGC regulation) that want to use the autobet \ autoplay function, have to first set a loss limit and the number of rounds. Any attempt without these two limits set, will result in these fields being highlighted in red until set. In addition to these regulatory requirements, the maximum number of autobet \ autoplay rounds is 25. Sounds - Control the 'Ambient Sounds' and 'Sound Effects'. They can be switched on\off by selecting the appropriate checkboxes. By default the all sounds are switched on.